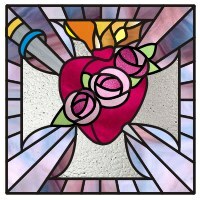 The parish of Immaculate Heart of Mary was founded on May 3, 1894 to serve the growing Polish Catholic community in the southeast area of Cleveland. The parish church dedicated in 1916 is a neighborhood landmark of striking beauty. The parish once sponsored an elementary school that was the result of collaboration between Sacred Heart of Jesus and Immaculate Heart of Mary parishes. At the time the school closed, 167 students were enrolled. At its peak school enrollment numbered 1350 students in a 16-classroom building. A parish hall/gymnasium, rectory and convent complete the parish facilities. As the parish community moves into its second century parish membership numbers approximately 1,100: young and old, English speaking and Polish speaking, comprised of city and suburban residents. The parish mission today is the same as it was in 1894: serve the spiritual needs of parishioners; remain as an anchor of the neighborhood in which it is located and welcome all Catholics and new immigrants along with instructing future leaders of our Church.